Bed bugs are in the news often. 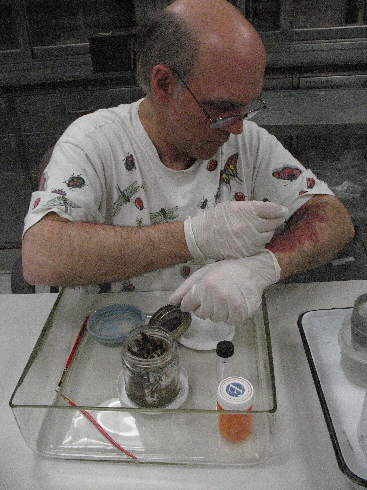 Please read about our entomologist and his work with Cimex lectularius plus other insect studies that Lou works on. January 23, 2020. The January meeting (Wednesday, January 20, 2010) of The New York Entomological Society featured Lou and his presentation: "What Do You Really Know About Bed Bugs?" geared toward the general public and Pest Management Professional alike. Three other people also were featured. Please read the review, An evening of bed bugs, by Renee Corea from New York vs Bed Bugs. August 27, 2010. What work does Lou do? Watching bees? Please read the article to find out. Correction: bed bugs don't hitchhike on human bodies like ticks,lice, fleas, but will be on personal belongings. Unfortunately, no mention of relative sizes of nymph and adult and their normal coloration was included by the reporter. You can search for us online or continue reading about us on our web pages. Feeding Cimex on my arm. Red mark is a birthmark (nevus) and is not a result of feeding bed bugs. Photo by Tom Gartner. We welcome your questions and queries. Please use either our Request Information or Contact Us pages and one of our staff will get in touch with you.